If you have been invited into someones home many of us want to take a little something to say thank you for the generosity. 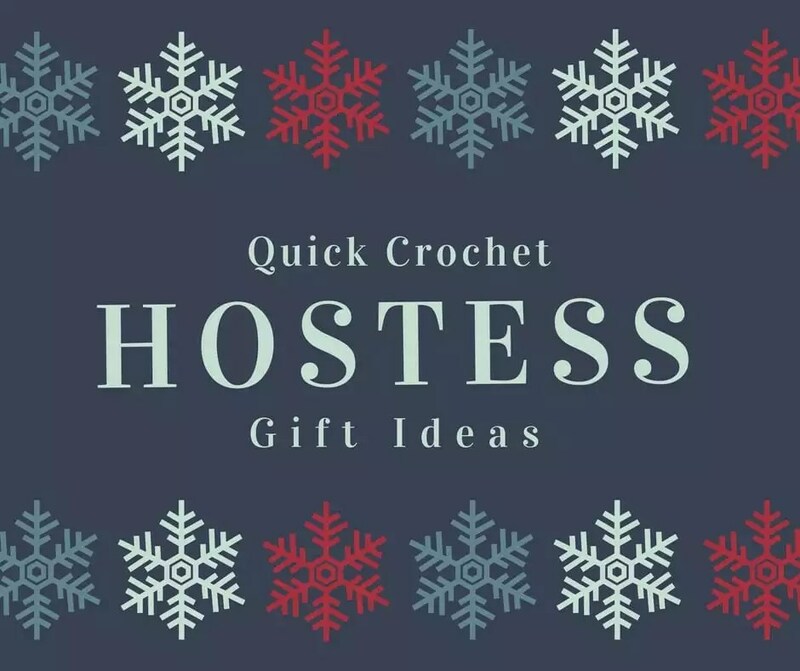 Wether you are being hosted for the holiday season or just any other day of the week lets talk about some quick crochet patterns that you can make as hostess gifts. These ideas are made with little yarn or only take a few hours to complete. Around the holiday’s we find that we are invited to the homes of our friends and loved ones and want to take something extra special to say thank you for all that they have done for us. Since I knit and crochet I enjoy making something handmade to give to those that invite us over. I will be honest that sometimes time slips away from me and I end up with only a few days to make a project. I never let a time crunch get me down, I just think about a new project that I can get done in the time that I have. Below are some great ideas that you can take use to find the perfect pattern for the family or friend that invited you over. Coasters are a great idea to make when going to visit. You can make them to watch the colors of their home or the season that you are visiting. With so many options you can work with simple patterns of squares or circles or make it a little more advanced and pick you favorite motif pattern. Hostess gifts are always great when you can use them year round. Gifts can also be great when you pull them out once a year and think about that special person that took the time to make it for you. Download the FREE Star Coaster Pattern from Red Heart. Red Heart has a line of yarn called Scrubby (original, cotton and sparkle) that is perfect to make washcloths from. Scrubby original is designed to keep the sour stench out of your washcloth. It is made from polyester so it will dry faster than traditional cotton. Fear not if you are a cotton love, Scrubby comes in cotton just for you! There is also a sparkle version, which is similar to the original, but can really step up the pattern particularly for the holiday season. If you missed it, this past year, Red Heart ran a 7 Months of Scrubby Campaign offering new patterns each moth. You can learn about each month’s theme and the new patterns in my various blog posts. Download the FREE Dishcloth Bouquet Pattern from Red Heart. Look for a scarf or cowl pattern that is using one stitch pattern to make your project. When you don’t have to change the stitches, increase or change colors the pattern will work up super fast. Consider using chunky yarn, like Red Heart Collage, to make your item. Using thicker yarn will also help you to finish the project in a short amount of time. Check out the seed stitch cowl that I designed as a teach gift idea. It would be perfect for next hostess gift. Download the FREE Cool Finger Crochet Cowl Pattern from Red Heart. Coffee cup cozy patterns are great for little gifts. They can be made super fast and use up scraps of yarn. Make the cozy in colors that the host loves or add some embellishments to personalize it. Think about adding a button to connect it around the cup or maybe an appliqué that would fit the host. Download the FREE Zigzag Crochet Cup Cozy Pattern from Red Heart. Wine bottle covers can seem like a no brainer. If you are lucky enough the host that you give it to will be willing to crack the bottle open and share it with you. Make a full bottle cover or just a bottle topper. Either way the project and work up quickly and add a little personalized handmade touch to your gift. If you want to take it a step farther you could add a set of wine glass charms so that you can remember which is your cup while you share! Download the FREE Dottie Bottle Cozy Pattern from Red Heart.